McDonald’s is a major component of the S&P 500 and Dow Industrials indexes. The company is also a dividend aristocrat, which has been consistently increasing its dividends for 32 consecutive years. 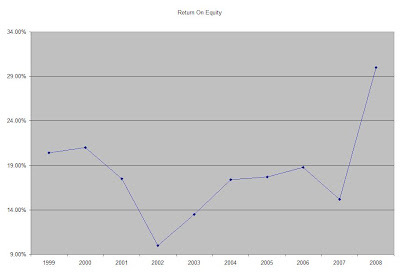 From the end of 1998 up until December 2008 this dividend growth stock has delivered an annual average total return of 6.70% to its shareholders. At the same time company has managed to deliver an impressive 11.70% average annual increase in its EPS since 1999. Analysts are expecting MCD to grow EPS to $4.20 by 2010. The economic slowdown is making consumers to trade down and dine out at fast food places like the ones owned by the Golden Arches. Mcdonald’s has been focusing more on expanding the sales of existing restaurants since 2003 versus relying on new stores to be the driver for growth. Same store sales and profits have been driven by product innovation, and comparable-store sales growth, and are part of the company’s recent success. The constant innovations in the menu are indeed fueling strong same store sales volumes. International operations, which accounted for almost half of operating profits in 2008, have been a major growth factor over the past two decades. This however exposes the company to fluctuations in exchange rates, which could add or detract from EPS performance. The ROE has remained largely between 14% and 21% with the exception of lows in 2002 and recent highs for this indicator in 2008. Annual dividends have increased by an average of 29.20% annually since 1999, which is almost three times higher than the growth in EPS. A 29 % growth in dividends translates into the dividend payment doubling almost every two and a half years. Since 1978 McDonald’s has actually managed to double its dividend payment on average almost every four years. The dividend payout has steadily increased over the past decade, due to the fact the dividend growth was much faster than earnings growth. Currently the payout is a little over 50%, which good. A lower payout is always a plus, since it leaves room for consistent dividend growth minimizing the impact of short-term fluctuations in earnings. The slow growth in earnings could put future dividend increases at risk. McDonald’s is currently attractively valued. The stock trades at a P/E of 15, yields 3.70% and has an adequately covered dividend payment. The company has proven to be somewhat recession resistant. I would be a buyer of MCD at current prices, as long as it does not increase above $66.